On my way to Lake Geneva, WI via Metra train to Harvard, IL Saturday- I ended up with an hour layover in Crystal Lake. Wonderful organic and local farm menu and selection of booze. 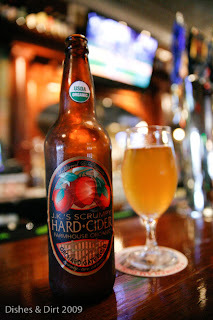 I opted for a for a Scrumpy's Hard Cider from Flushing, Michigan and tempting as the menu items looked, I saved an appetite in favor of dinner at my final destination. Chatting it up with restaurant manager, Aaron Andrews, I learned a bit about the restaurant's commitment to using fresh and local ingredients- and the growers they work with. I'll definitely return soon- Prepared to eat well!